Yesterday was my grandma Klassen’s funeral at Alexanderwohl Mennonite Church, where she had been a member for decades. My uncle, a pastor, gave the meditation. He had been a missionary in Vietnam during the war, and he remained there after the United States withdrawal. During that time, things were very dangerous for him, and all means of communicating with the family back home were completely cut off. My grandparents had no way of knowing if he was OK.
That exchange sums her up pretty well, I think. She was so deeply religious that it gave her a great sense of peace about life. We heard so many stories about her this week. We heard how, when she was already in her upper 80s, she helped a farmer get his equipment out of the mud and ran some heavy farm machinery. She was in charge of my cousin’s schoolwork for a little while (she lived with them back then, and his parents were taking a trip). She apparently made sure he did every little assignment left for him in exacting detail, even the ones that his mother had said were “extra”, just in case he needed something else to do. Apparently when his parents got back, he said he loved his time with grandma, but begged them to never put her in charge of his schoolwork again! I told the story of learning to play chess when I was a child. My grandpa was teaching me the game. I was having some trouble learning some of the rules, and was frustrated because he was also beating me (like usual). After a little while of me getting more and more frustrated, grandma said something to him in German and all of a sudden I started winning. Yesterday evening was the community Good Friday church, with the combined choirs of our church and Alexanderwohl singing. That wasn’t the easiest thing to do after the funeral in the morning, but I’m glad I did. Tomorrow I’ll be singing again for Easter. Jacob has lately been telling us “gate gamma kassen so sick” (Great Grandma Klassen is so sick), after his visit to the hospital, and it’s true. Today started normal enough, but by 2:45 I got an email from my mom, saying that grandma had taken yet another turn for the worse; her pulse was racing, her temperature feverish, and her breathing shallow and difficult. The last grandchild that was going to be there made it, and got the last flicker of recognition from grandma. I wrapped some things up at work. Then I made the short drive from work to the nursing home, and got there just after 4. I went in to her room there, and it was full of family. Two of her children were singing her favorite hymns. I can never forget my uncle’s deep bass voice as he stood at her bedside, holding her arm, while my aunt patted her head, both of them singing. Grandma’s only remaining sibling, her younger brother Melvin, sat on the other side of the bed, looking on. Grandma’s white table and chairs, which were in grandma and grandpa’s house as long as I can remember, and followed grandma through all of the four other places she lived in the last years of her life, were in her room at the nursing home too. It always felt like home to be with grandma and those familiar things that she always took with her. Despite what was happening, I was glad she was back at home. My uncle motioned me over to her bedside, and I took her hand for a few minutes. It felt cold and weak; for the first time, she didn’t grab my hand at all. A nurse came in to check oxygen saturation, but the machine wasn’t able to get a reading due to poor circulation to her hand. She wasn’t able to get a heart rate either because the heart was racing so fast. She discussed briefly whether the family wanted them to continue giving her oxygen, and they decided that they would, for her comfort. My uncle and aunt kept singing. I blew my nose and dabbed at my eyes, and there were hugs all around. And just a few minutes later, grandma peacefully stopped breathing, maybe 20 minutes after I had arrived. They went to get the nurse, who came back to listen to grandma’s heart again, though we knew what she would find. She took the stethoscope off, and she almost lost her composure, but managed to say “you can turn the oxygen off now.” Several people gave grandma a last hug. After a few minutes with just the family, they told the nurses to go ahead and call the funeral home. That set off a lot of activity making arrangements for the next few days, funeral plans, and the like. I stepped back into grandma’s room a few times, while the family was in the sitting area right outside it discussing. I looked around at the family photos on the wall, the old table and chairs, the recliner. Now, these are the things that were grandma’s. It didn’t feel like home anymore. Grandma has enjoyed a simple life and had requested a simple death: no extraordinary measures at the end of life, no embalming either. So, by law, the burial must happen within 24 hours of death, and will be tomorrow. After all the arrangements, people realized nobody had supper yet. We went to the quickest available option — pizza — and ate there. It was paid for out of grandma’s remaining money — the last meal of so many that she provided for her family over the years. It was a happy meal. As I drove home, NPR news was on the radio. There were the same stories we hear all the time: the economy, the mideast, the president. Normally I’m interested, but today I shut it off. Today is different. Tomorrow, for the second time in four years, I will help carry a grandparent’s casket a few days before Easter. I’ll end tonight with this photo. It was taken soon after Jacob was born. 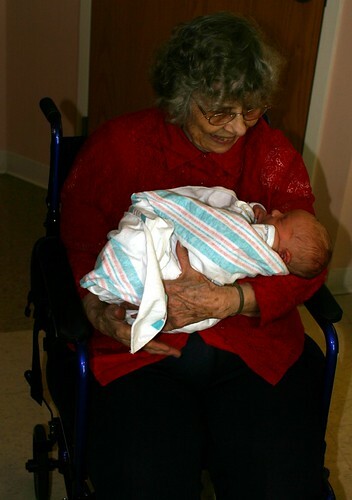 Grandma came to the hospital and held him. That smile sums her up perfectly. Today over lunch, I and 6 others went to visit Grandma. I knew that moment would happen someday, but still was surprised when it happened. Mom told her that we were there to tell her we love her. Grandma counted out the seven of us, and said, “All these wonderful people here to tell that to ME?” That’s Grandma still there! It was a difficult moment. Many of us were tearful, and Grandma was sick enough that she sometimes lost the battle to stay awake. But we were all glad it was happening. It’s not that Grandma was depressed or anything. Just that she had long ago been at peace with the idea of death, and actually told us more than once that the was rather surprised that she has lived to be as old as she has. So it wasn’t frightening or surprising to her to confront her own mortality. To her, it was a fact, and an obvious one at that. As we walked down the hall, I was reminded of her old tradition going back many years. Whenever we would leave her house, she’d wave to us from the porch. And, if it was dark, we’d turn on the car light and wave back. Since she’s been in the nursing home, she’ll wave to us from her doorway as we walk down the hall. And, sure enough, today’s visit ended with her waving to us from her doorway with both hands (as she always does) and a big smile. We all waved back with a smile as we walked away, too. I don’t know if this will be the last goodbye with her, but if it is, I can’t think of a better one.